In this chapter, we present basic terminologies and concepts of graph theory in addition to a few social network measures that will be used throughout the book. Then we explain more advanced metrics and concepts that would leverage the basic network measures such as estimating blogs and bloggers’ influence scores and focal structures analysis (FSA). These concepts were used in many real-world cases to find coordinating sets of individuals (coordinating groups) in a given graph. All the concepts and measures are described and illustrated with examples. 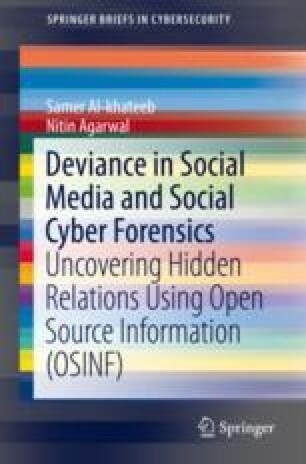 This chapter would provide the readers with basic understanding of graph-theoretic concepts and social network measures that will help understand the concepts of social cyber forensics in the later chapters.